Your Yellow Lid Bin is for Recycling only. This bin is collected fortnightly, on the same day as your Residual Waste Bin (on the alternate week to your Organics Bin). 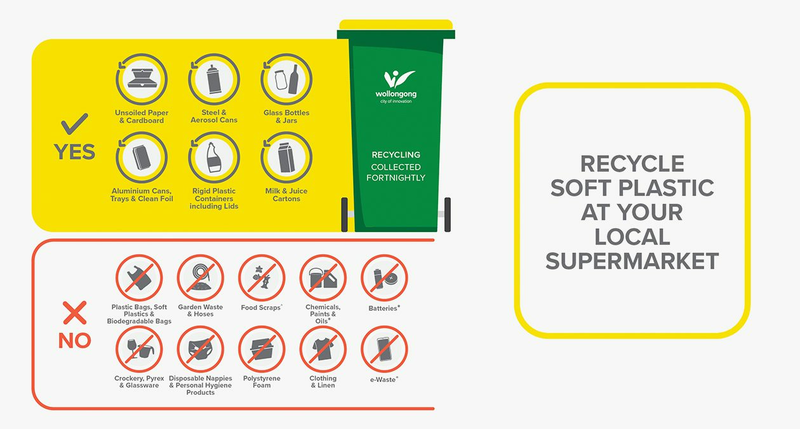 Your recyclables are taken to a transfer station at Kembla Grange. The material is then bulk hauled to a Materials Recovery Facility in Sydney. Your recycling is sorted and then sent onto various recyclers to be made back into paper, new containers and various other new products. Plastic bags are NOT accepted in your Recycling Bin. These will contaminate the recycling process. If you put the wrong items into your Recycling Bin it may not be collected. Property owners can arrange an additional 240 litre bin if one is not sufficient. Additional services are levied through your property rates system. For applicable fees click here. To request an additional Recycling Bin, please click here. Looking for information about recycling and waste services in your local area? The Recycling Near You! website contains information about residential recycling and waste services offered by Wollongong City Council, as well as local drop-off options for your items including computers, batteries, printer cartridges, mobile phones and many others. Bins must be placed out before 6:00 a.m. on your collection day and removed from the kerbside on the day, after they have been serviced.